Hear ye, hear ye — For admittance to the castle, knock three times if you’re a prince! 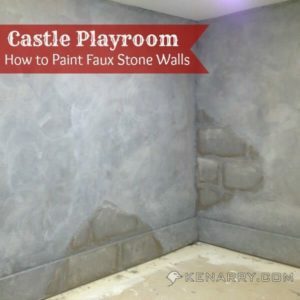 See how we made the castle playroom curtain complete with a door, window and exposed stone patch. Children believe in magic, fairy-tales, and happily-ever-afters. It all begins when they wander through a door into a world of make-believe. 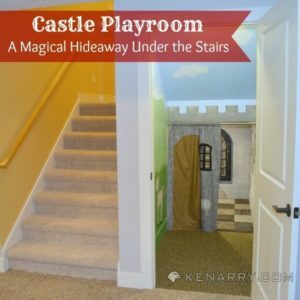 I held tight to that premise as we created the castle playroom under the stairs for our boys. 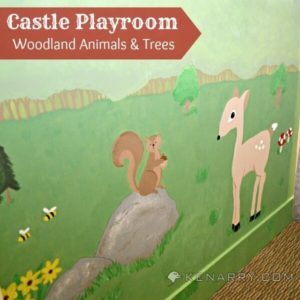 Thus far in this series, we’ve painted the castle and the woodlands then we added wall-to-wall flooring. Next, we needed to make an entrance. I wanted the castle to feel like a safe hideout or a clubhouse. 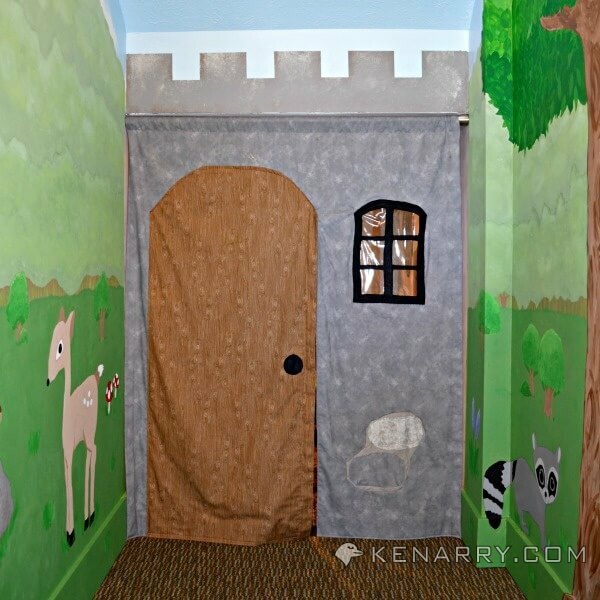 Rather than building a permanent wall or door, I chose to use fabric and make a castle playroom curtain. Before we go any further, I should say I am NOT a seamstress. I can hardly even call myself a beginner. I’d only had my sewing machine for a few months when I made the castle playroom curtain. Thankfully my mother is very good at sewing and was willing to sit alongside and advise me while I worked on this project. If it hadn’t been for her, I’m not sure I would have gotten through it. I learned about sewing in my home economics class many, many moons ago, but this was the first actual project I attempted with a sewing machine in years. As such, you’ll see uneven stitches and hems that aren’t so pretty. 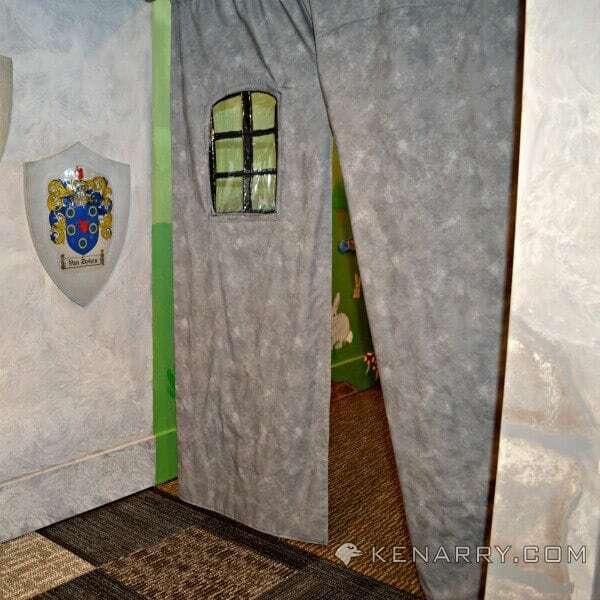 Others who can sew would do a far better job, but as my mom kept reminding me “it’s only a playroom.” What I created for the castle playroom curtain achieves the clubhouse look and makes my boys happy, so what more could I ask? 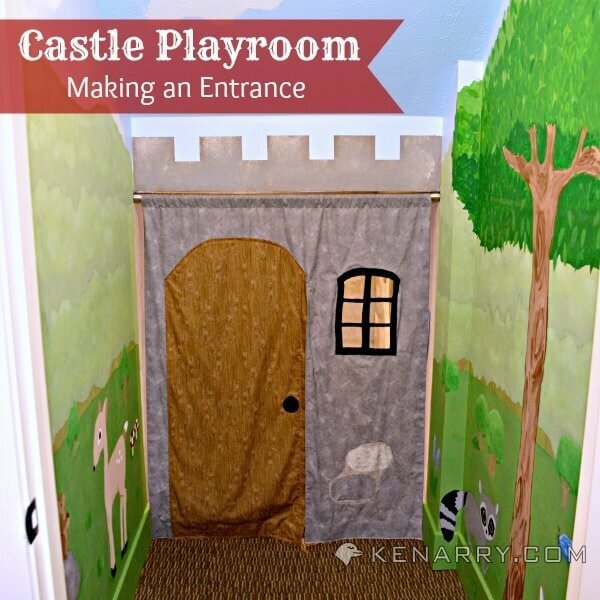 Here is everything you will need to know about how to make a curtain in your playroom that looks like a castle. A tension rod (Note: I used the 26-inch by 42-inch InterDesign Forma Shower Curtain Tension Rod in brushed stainless steel. It was easy to tighten and secure in place. After more than 9 months of active use, it hasn’t fallen or been pulled down. 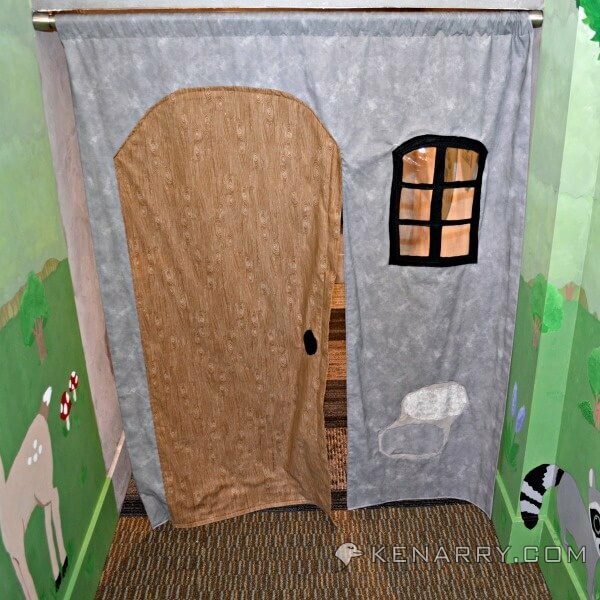 I didn’t know I’d be blogging when I started the castle playroom curtain, so, unfortunately, I don’t have great step-by-step instructions and photos for this tutorial. I’ll just share photos of some of the features along with some helpful tips. 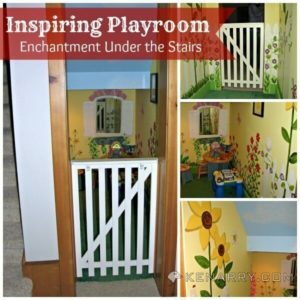 You can then use your own imagination (and better sewing skills) when you make one for your children’s castle playroom. 1. Pocket loop to hang the curtain: One of the first things I did was fold the material in half and sew a pocket loop near the fold. I left just enough room so the curtain could easily slide along the tension rod when it was hung. 2. The door: I wanted a real door in the curtain for the children to go through to enter the castle. I didn’t want them to have to go around or move the curtain. Initially, I thought about making a hinged door that could swing open and close, but I wasn’t sure how they’d keep the door closed when they were in the castle playroom. 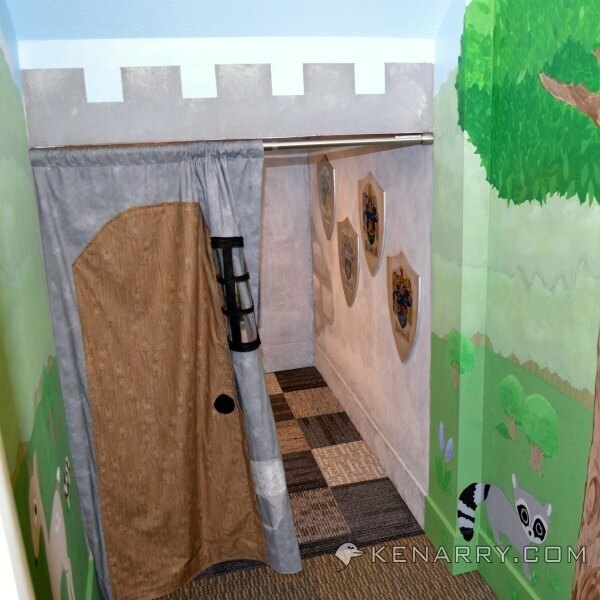 Instead, we chose to make a large slit up the center of the castle playroom curtain so the children go through like they would go into a tent. The brown door is sewn over the top of the gray castle wall fabric. There’s a slight overlap so you don’t see the gap in the curtain when the door is closed. 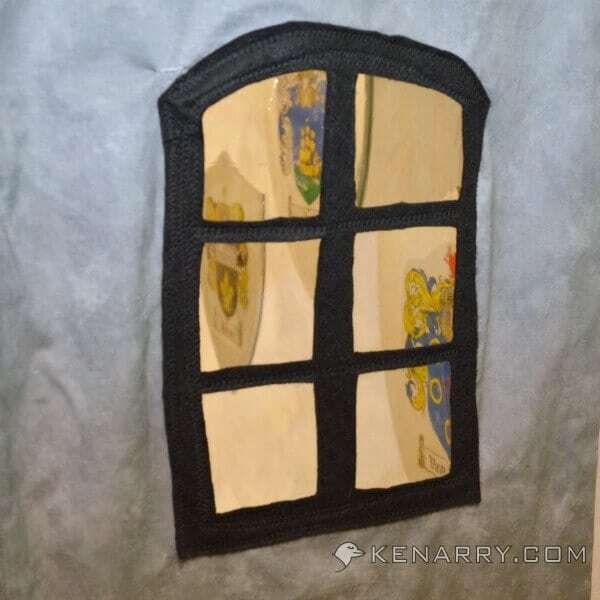 The door knob is just a black felt circle which I sewed on the brown door before I sewed the door on to the rest of the castle playroom curtain. From inside the castle, you actually don’t see the brown door at all, just the gray “stone” wall. 3. 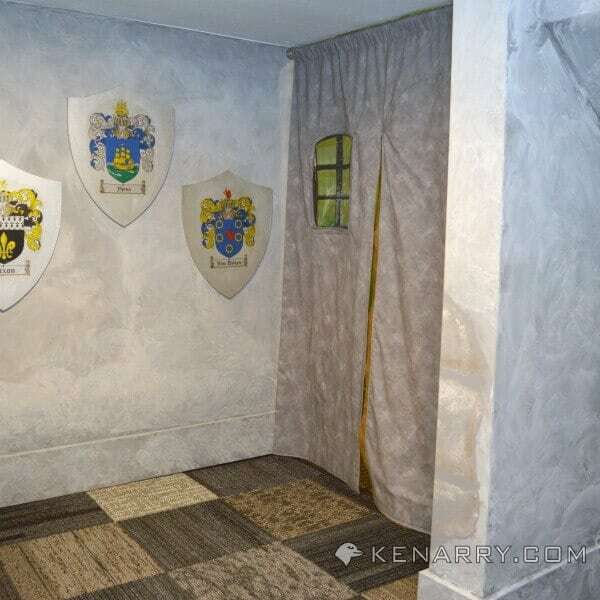 The exposed stone patch: After painting exposed stone patches on the interior of the castle, I thought it would be fun to also have one on the castle playroom curtain too. It was challenging for a sewing novice like me. 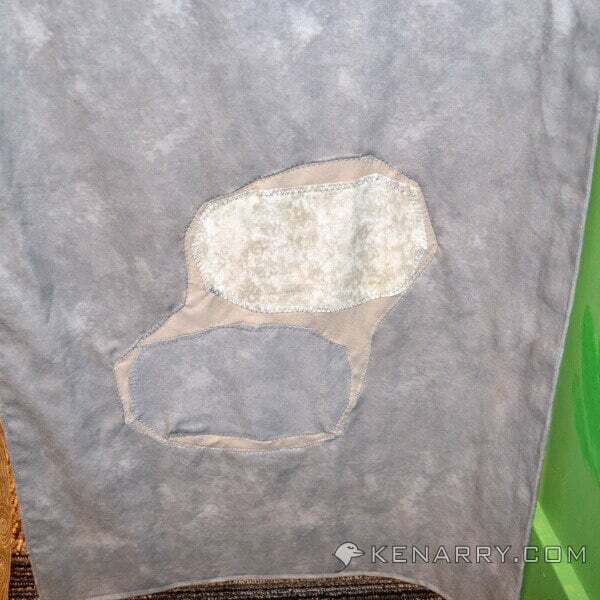 I cut two stone shapes out of gray stone-like fabric and sewed them on a solid light gray fabric to be the grout. I sewed the whole patch on the front of the castle curtain before I sewed the curtain closed so I could hide my stitches between the two layers of curtain fabric. 4. The window: Somehow I got it in my head I wanted a window so the boys could peer out to see who’s knocking on their castle door. Within moments of cutting the hole for the window, I’d wished I never started! This is where heavy duty sewing machine needles are a must. I used thick vinyl to be the “glass” in the window and black felt to be the window frame. I made the window arched to mimic the mirror “window” we hung on the back wall of the playroom. I sewed the vinyl onto the black window frame first. Then I sewed the window to the front of the castle playroom curtain to secure it in place. From inside the castle, the back of the window is very ugly with stitches. On the upper right, you can also see where I accidentally tore and repaired the fabric after the thread got bound up in my machine. 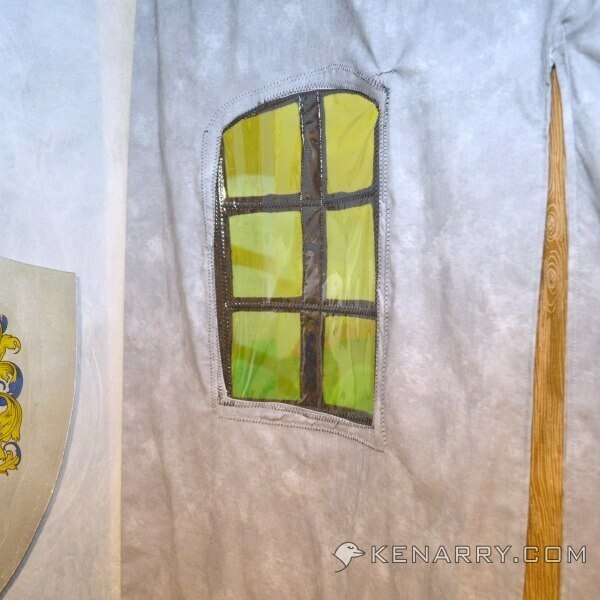 Creating this window was the most frustrating part of the entire castle playroom project for me. I was angry with myself for even attempting it. 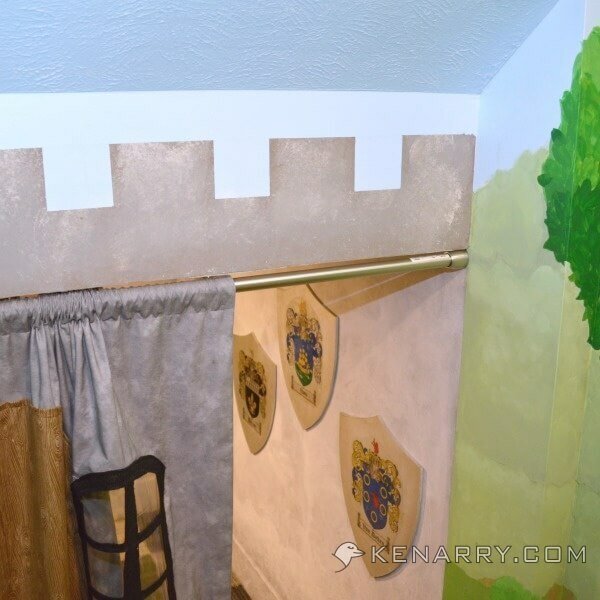 Yet the very first time I showed the castle playroom curtain to our son, who was three years old at the time, he ran in through the opening in the door, and then immediately peeked out the window at me with the BIGGEST grin on his face. Phew. It was worth my late nights and frustrations after all. I know I didn’t cover every detail behind the making of the castle playroom curtain. 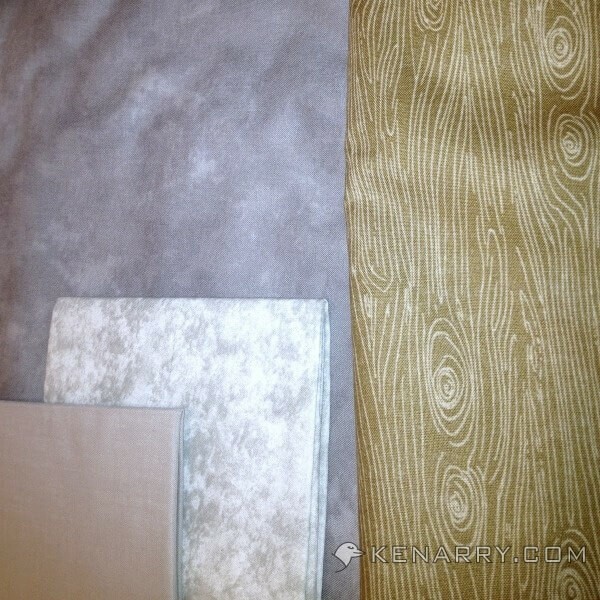 If you have any questions about how I approached the castle playroom curtain, please comment below or contact us. 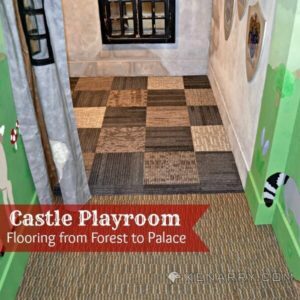 We created an entire series of posts showing how we created a castle-themed playroom for our kids. With these tutorials, you can create one too. For more tutorials and recipes, subscribe to Kenarry. 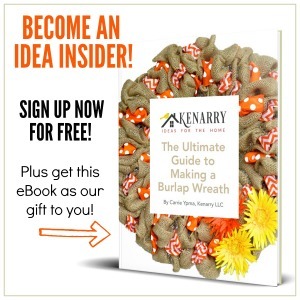 You will receive emails when new ideas are posted. Originally published June 2014. Updated June 2018. Wow – I just linked over from Cupcakes and Crinoline but kind of got lost in this series. What a wonderful gift to give your boys! Aww, yay! I’m so glad you got lost in the series, Sarah. That’s exactly what I’d hoped would happen when we started it! I do hope you’ll be back in the coming weeks to read the rest of it. wow! just wow! I wish we had a playroom so I could do this. Thanks, Audrey! Got a spare closet that could work by chance? This room is adorable. I have enjoyed the series, but I think this curtain is my favorite. Hello from Let’s Get Real (co-hosting this week). Thanks for following along in the series, Melissa. I appreciate your kind words, especially since the curtain was one of the most frustrating parts of the whole project for me. Good luck with the move, Clarissa! Hope we inspired something fun for your boys once you get settled in. I really love this idea!! It is fun because it would be great for boys! I feel like I always see princess ideas. Great to see something I could use for my son! I know what you mean, Theresa! It seems like castles are always pink and purple with girly princess features. What about the kings, princes and knights? I’m swelling with excitement to hear there was a part of this series you were looking forward to, Steph. I know I didn’t provide a pattern or anything, so if you have questions as you work on the cottage door for your girls, please don’t hesitate to contact me. I’d love to see photos when you’re done! If you blog about it, please come back and share the link.